Gone are the days when a simple glazed donut is enough of a treat to satisfy the collective sweet tooth of so many. Upscale donuts and upscale donut shops are strong trends. Now frying the donut just right can be tricky, unless you have the right donut-specific fryer. Pitco’s 24R-UFM donut fryer features a 3-inch deep oil pool with a 34-inch cooking area. This helps to maximize oil efficiency and output, and makes it the perfect donut-making machine. The 24R-UFM features an advanced solid-state thermostat for precise temperature control and melt cycle capability, a labor-saving integrated filter for longer oil life and a 3″ frying depth for better utilization of cooking area, especially for floating bakery products. Large cool zone for better frying. Traps particles and crumbs, prevents a major cause of fat breakdown and eliminates taste transfer. Easily adjustable drainboard cover for desired drainage angle. 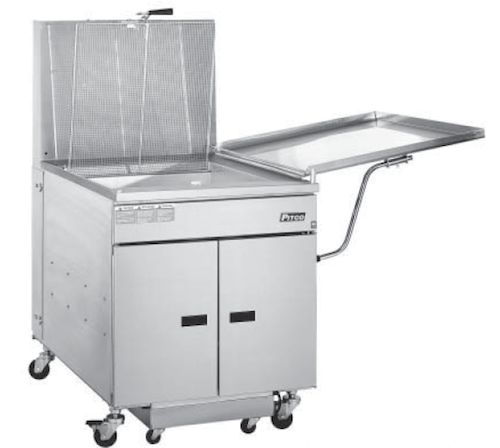 Folds over as a cover when fryer is not in use. Pitco’s donut fryers have a welded tank with a super smooth machine-peened finish to ensure easy cleaning. Long lasting, high temperature alloy stainless steel heat baffles are mounted in the heat exchanger tubes to provide maximum heating and combustion efficiency. Pitco Donut fryers are available in both natural/LP gas and electric. 24″ and 34″ fry area.